Join me Wednesday, January 19th, for a live and interactive webinar with Yong Zhao on the Chinese education system, international test scores, and "Tiger Moms." Professor Zhao has been a previous guest on the show to discuss his book Catching Up or Leading the Way: American Education in the Age of Globalization and we revisit those themes in light of current educational discussions. Yong Zhao is currently Presidential Chair and Associate Dean for Global Education,College of Education at the University of Oregon, where he also serves as the director of the Center for Advanced Technology in Education (CATE). He is a fellow of theInternational Academy for Education. 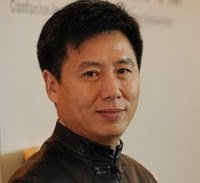 His research interests include educational policy, computer gaming and education, diffusion of innovations, teacher adoption of technology, computer-assisted language learning, and globalization and education. Zhao has extensive international experiences. He has consulted with government and educational agencies and spoken on educational issues in many countries on six continents. His current work focuses on designing 21st Century Schools in the context of globalization and the digital revolution. Zhao has published over 20 books and 100 articles. His most recent books are Catching Up or Leading the Way: American Education in the Age of Globalization and the Handbook of Asian Education . He has also developed computer software, including the award-winning New Chengo/ZON (http://enterzon.com), the world’s first massively multi-player online role-playing game for studying Chinese. Zhao was born in China’s Sichuan Province. He received his B.A. in English Language Education from Sichuan Institute of Foreign Languages in Chongqing, China in 1986. After teaching English in China for six years, he came to Linfield College as a visiting scholar in 1992. He then began his graduate studies at the University of Illinois at Urbana-Champaign in 1993. He received his A.M. in Education in 1994 and Ph.D. in 1996. He joined the faculty at MSU in 1996 after working as the Language Center Coordinator at Willamette University and a language specialist at Hamilton College.